CBM’s property managerial agent arm, Empire City Consultants (ECC) recently launched the MyCondo mobile phone app. ECC sought to streamline the process of condominium residents’ facility bookings, resulting in the development of the app. Developed in-house, the app is currently deployed at a few condominiums, and allows for their residents to check the availability and immediately reserve any facilities such as barbecue pits, function rooms and tennis courts etc, making it simpler and faster to reserve any facilities. The app will also eventually expand to allow for maintenance fees, sinking funds etc, to be paid directly off residents’ mobile phones, bringing around more convenience. 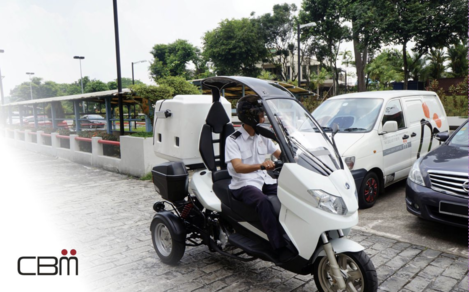 Developed by CBM’s system integration arm, Ingensys Pte Ltd, the Mobile Enforcement Vehicle (MEV) is able to increase manpower efficiency by up to 30%. The MEV utilises a proprietary license plate recognition engine (LPRE) to compare parked cars within a compound against a database of season parking ticket holders and registered entrants to the car park. The MEV is currently in use by CBM Parking, whose parking wardens will no longer have to walk along parked cars to scan license plates. This can reduce the time spent by wardens to enforce parking offenders such as tailgaters or act against non-season parking ticket holders who have parked in a season parking lot. With the rise of technology and a significant shift in how the industry speaks about innovation, CBM’s Environmental Division recently acquired the iScrubbot 300. 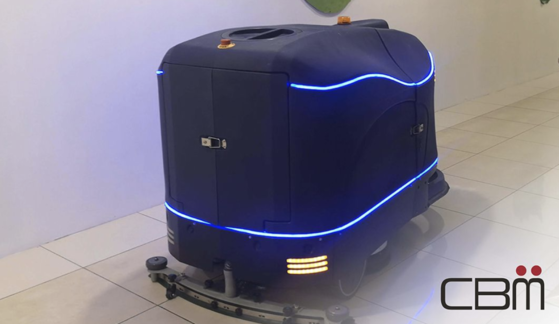 An autonomous machine, the robot can be pre-set to any required settings according to the location it is placed at and would not require anyone to be present to monitor or operate it. The machine will also upload a daily operations report that would allow CBM to monitor its efficiency, as well as the respective operations areas without having to spend additional man-hours recording information manually. The use of technology reduces the number of man-hours required for cleaning by up to 50% for the area the machine operates in, allowing CBM to better deploy its resources and pass on the cost-savings to our clients. The annual Assisi Fun Day was held on 24 June 2018 and saw over 10,000 visitors visiting the full-day event. 2018’s iteration of the palliative care organisation’s fund-raising event saw City Developments Limited (CDL) & CBM Pte Ltd (CBM) as co-organisers yet again. Over 120 CBM volunteers gave up the better parts of their weekends to help with logistics, maintaining order & ensuring that the cleanliness of the premises. Mr Ong Ye Kung, Minister for Education was the Guest of Honour for the event. Both he and Mdm Ho Ching, Patron of Assisi Hospice graced the event with their presence. Mr Sherman Kwek, Group CEO of CDL, went the extra mile at “The CDL Challenge” where he made a splash for charity at the dunking machine. This charity segment alone raised $183,846 from CDL’s business partners and visitors to the carnival, more than doubling the donations from his efforts in 2017. In last year’s event, Mr Kwek peddled guests on a trishaw and raised $76,378 for Assisi’s patients. This year, Assisi raised over S$1.1m through the sale of meals, snacks, toys, an assortment of nostalgic paraphernalia and outright donations. Some stalls also ran game stations for the young and young-at-heart. In total, the combined efforts raised more than the fund-raising goal! The funds raised will be used to ease the lives of the terminally ill patients of Assisi Hospice as well as provide support for patients’ families. A 2-year Memorandum of Understanding was officially signed by Mr Roy Chiang, CEO/President, CBM Pte Ltd and Ms. Koh Gee May, Acting CEO, MINDS. MINDS’ clients are employed as Laundry Attendants with Systematic Holdings on a 1-year renewable contract. Giving back to our society means much more than just donations, be it in cash or in kind. More than that, it is the act of enabling them to engage with our society. Persons with Intellectual Disability (PWIDs) have difficulty getting and maintaining employment as they are stigmatized by society to be ‘unfit for work’. Systematic Holdings, however, believes otherwise. Systematic Holdings, CBM’s laundry subsidiary, recently partnered with the Movement for the Intellectually Disabled of Singapore (MINDS) to collaborate and provide employment opportunities for its clients. These clients would take on tasks like folding and packing of fresh linen. These individuals are guided through Systematics’ workflow by MINDS’ Training Officers before taking on heavier responsibilities. These responsibilities include the operation of various machines and equipment, as well as preparation work for new laundry such as sewing RFID tags for uniforms and linens. With a five-day work week of about 27 working hours in total, these clients work within MINDS’ facility that has been configured to mirror the environment in Systematics’ laundry plant. Apart from a basic salary and annual leave, the clients also enjoyed employment benefits such as a daily meal allowance, CPF contributions and medical coverage. Systematic Holdings hopes that such initiatives would not only benefit MINDS’ clients, but would also create awareness to allow individuals with special needs to gain industrial experience and be independent. Such an initiative would also give the clients more confidence and promotes social intergration with the non-social service able bodied workforce. The Movement for the Intellectually Disabled of Singapore (MINDS) was founded in May 1962 by a group of philanthropists who saw the need to provide equal opportunities for children with intellectual disabilities to receive education and later, to be integrated as contributing and responsible citizens in Singapore. More information on the organisation can be found here.